While reading this thread and this one I had trouble following the football terminology of the different "techniques" for defensive line men. What does it mean to have a 1 / 2 / 3 / 5 gap technique defensive linemen? What does that gap mean? 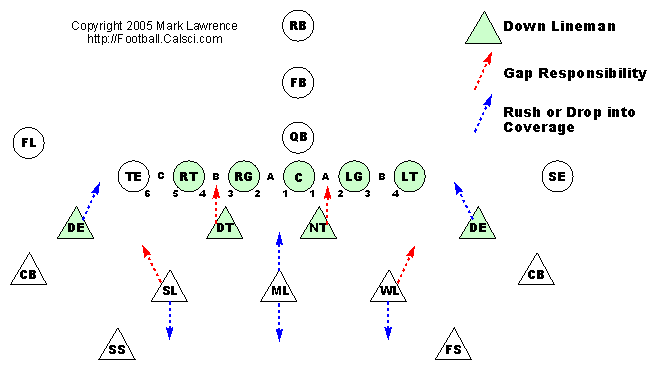 The gap refers to the empty space between offensive linemen on the opposing team at the line of scrimmage. If you have a 1 or 2 gap defensive linemen, it means that he is responsible for keeping the offensive team from advancing through either one or two gaps, or responsible for advancing himself between the gap and tackling the ball carrier behind the line of scrimmage. See the below example for an illustration. In this example the defensive linemen (the four shaded triangles) are all playing a one gap technique as they are only responsible for a single gap in the offensive line of scrimmage. The offensive team often uses the terms "A-Gap" or "B-Gap" to refer to the gaps on the offensive line. The A-Gap's are the gaps on either side of the center. The B-Gap's are the gaps between the guards and the tackles. The C-Gaps are the gaps between the tackles and the tight-ends. So a running play that was meant to run to the "Strong-side B-Gap" would run to the offensive right (strong-side is determined by the side that the tight-end is lined up on) between the Right Guard (RG) and the Right Tackle (RT). Not the answer you're looking for? Browse other questions tagged american-football defense or ask your own question.